Love the rug but it does not stand up well to pets. The rug frays easily. A whimsical children's design and dense, thick pile highlight this ultra soft and plush New Zealand wool pile handmade rug. This floor rug has a blue background and displays stunning panel colors of blue, ivory, green and red. 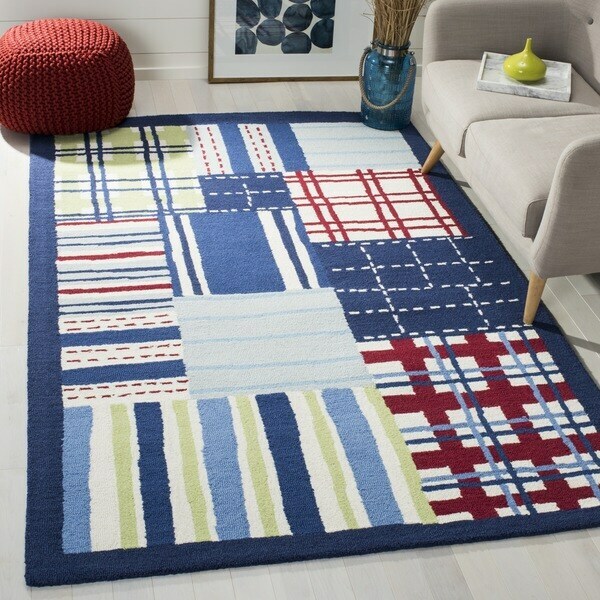 This is a really cute rug...bought it for a playroom and it works well. The colors are as pictured and the quality is pretty good. The rug itself is really nice and high quality, but when the description says it's "ultra soft and plush" it lead me to believe it was a cut pile and not looped. It is NOT soft, especially beings I bought it for my sons room to play on. I am very disappointed and would have returned it had it been easy. Again - nice quality rug if you are looking for looped pile, the description should include that. Love the pattern and it will go nice in my sons room. The quality of this product/supplier was also deciding factor.